An independent contractor agreement is a legal document between a business and an independent contractor, freelancer or subcontractor. It’s an all-encompassing document that outlines the details of the work to be performed, terms of the agreement, deliverables, compensation and any additional clauses. In this article, we’ll provide you with a free independent contractor agreement template to download and customize. We’ll also share information on what to include and what to leave out if you’re working as a 1099 contractor or hiring them yourself. Disclaimer: FitSmallBusiness provides education and information and does not serve as a licensed attorney. Prior to finalizing contract language, have your lawyer review the agreement and make changes required by your state, industry or local practice. 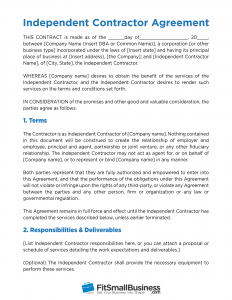 Here is an independent contractor agreement template that contains contract language beneficial to both your company and to the independent contractor you hire. It can be used by businesses seeking independent contractors and the subcontractors, solopreneurs or freelancers working for them. Depending on which side of the contract you’re on, you may find some of the information less important to you. However, just to keep things fair, we’ve included sections that benefit both employer and contractor. All contracts between employer and contractor should include basic information, such as contract terms, a detailed description of the work to be done, payment information, confidentiality agreements and even documentation on how to resolve issues should a disagreement occur. In addition, contracts should be signed by both parties. However, if you’re hiring a full-time executive or you’re hiring an employee and plan to pay them hourly wages or a salary you should use an employment contract form instead. If you want an easy way to send, receive, and update employment contracts as well as onboard employees, try Gusto. 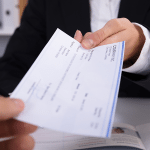 It’s small business payroll provider that lets employees sign forms and contracts in addition to enrolling in payroll and benefits, all online. You also get a secure document vault where you can store important employee documents like contract agreements. Click here for a free 30-day trial. The terms of the agreement include the names of the business and subcontractor, work location, date of the contract, and a high-level description of the project with details of the job to be performed. Be specific enough that it’s clear what needs to be done but not so specific that it takes up more than a few paragraphs — unless it’s a huge project with hundreds of milestones like building an e-commerce website. In that case, you’d want to attach the original bid proposal or statement of work. Provide compensation details and include how and when the contractor will be paid. A best practice is not to pay an hourly rate but rather a fixed rate for completion of the project with payments made at specific milestones. Using the fence example above, perhaps offer 25% payment once permits are received and utilities marked, 25% once post holes are laid out and dug, 25% when fencing material is up and the remaining 25% upon successful completion with a locking gate. These additional agreements typically benefit the business by protecting proprietary information and customer data. Because some states, such as California, have restrictions around these documents refer to our articles on how to create a nondisclosure agreement and non-compete agreements. Depending on the kind of contract and work, a freelancer may also wish to protect his or her intellectual property, ensuring it’s only used for the purpose intended and not resold by the business for profit. For example, if you commission an artist to paint a custom painting, the artist may not want you to make prints of the artwork to sell. This section should clarify the terms under which contract termination is acceptable. For example, perhaps the freelancer would like 30 days notice (or equivalent compensation) if they are terminated prior to the project end. Maybe the business would like to have a termination clause that states if the independent contractor quits before completing the project, it will result in a $1,000 penalty against the contractor as they may suffer time delays while searching for a replacement. Integration is a fancy way of saying that if one section of the independent contractor agreement isn’t valid, the rest still is. We’ve provided sample language in our template above. This section describes the state laws under which the contract should be enforced. It’s typically the location where the work is being done but, in the case of a business with offices in a specific state, they may prefer to write the contract subject to the laws of the state where the business is headquartered rather than the state where the work is being done. There are some additional options that you may want to include in your independent contractor agreement, depending on your specific needs and circumstances. Often, a business will require a subcontractor to maintain insurance coverage for liability and vehicles while they are doing work at the business location. If the subcontractor also has employees, additional insurance, such as worker’s compensation, is required. The subcontractor, who should have his or her own insurance, can obtain a certificate of insurance from a business insurance agent. You may want to request this within the contract. An employer often has projects stacked on a timeline. If one subcontractor fails to complete work to standards or on time, it can throw the entire project off schedule. The nonperformance clause can help prevent that. Here are two sections to omit from your contract to prevent potential litigation issues. In most cases, payments should be tied to deliverables or milestones, not to dates. That way you’re not obligated to pay a fixed rate next month if nothing gets done between now and then. Thus, having deliverables spelled out is a better way to manage payments than a payment schedule based on dates. Because unforeseen circumstances come up, both parties should have the option to terminate the contract. Perhaps a business doesn’t receive the funding it expected and can’t complete the project? Suppose the contractor develops an illness. It’s best to have no guarantee of employment or continuation. If this were an employment contract for a W-2 or 1099 employee, you would want the at-will clause to apply, stating that either party is free to exit the relationship for no cause. An independent 1099 contractor may want additional clauses added to a contract to ensure he or she is treated fairly. 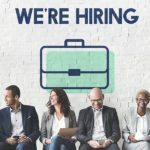 This is especially important if the company hiring the independent contractor is large as independent contractors won’t have much power once work has begun. Independent contractors need to be very specific about things like how approvals will be done and how disputes will be managed. For independent contractors to protect themselves, they should include instructions in the contract to explain when and how deliverables are to be reviewed and approved. For example, an independent contractor building an online training program wouldn’t want to have to wait 45 days for approval of a video clip while the business owner is traveling for business. In this section, clarify how you want disputes resolved. Many individuals choose to use arbitration rather than having contract conflicts involve attorneys and expensive court costs, especially when you’re an independent contractor working with a large, well-lawyered business. An independent contract agreement can protect you from paying for a contractor’s services and getting little in return. Similarly, it protects contractors with a written document so that they can be paid for the work they do. Its biggest benefit is that it clarifies who does what and who pays what for it. This alone may prevent disagreements and false expectations so both business and contractor can stay focused on the work. Don’t forget that employees and contractors have different compliance requirements, and you can face costly penalties if you don’t file correctly. Gusto can help by automatically issuing and filing your W-2s and 1099s and sending them to your employees and contractors when you onboard them. You also get access to HR specialists who can help you stay compliant with employment laws in all 50 states. Click here to try it free for 30 days. Our template contains contract language beneficial to both your company and to the independent contractor you hire.